I was sad to leave Terelj National Park. The beautiful panorama and its fresh air: definitely to die for. I could just sit outside and look at the stars if not for the minus temperature, that is. The sounds of dogs barking in the middle of the night somewhat made me hoping to see a glimpse of Jacob Black or Jon Snow even! But that wasn’t enough reason to spend the night freezing your toes off. Maybe I’ll come back during summer and get to the Northern part next time. I heard that it is really beautiful place and seeing reindeer people with my own eyes would be an awesome experience. Oh well, too many places to go and not deep enough pocket. Most of the people that I met or got in contact with in Mongolia are really nice people. The hostel that I stayed at was really comfortable and a very good location too. I have come into contact with a bunch of great people while staying there. Some are very, very experienced travellers and made me feel so small when talking to them but all in all we share the same thing: we love travelling. It doesn’t matter how many countries you have been to, where you are from or what is your occupation for you have your own story to tell. It is good to know that Mongolia is catching up with other countries and now doing their best to cope with modernisation. I was impressed when I came out from the cinema hall after watching Thor 2. It turned out that they have an amusement park aimed at parents who want to watch movies but don’t have a nanny or guardian for their children. How I wish we had the same thing in Malaysia. It’s really tiring to see parents who are so selfish and dragged their kids along to an 18PL movie, isn’t it? Don’t let me start with kids crying or throwing tantrum in the cinema hall. Seriously, who in their right mind would bring their 2-year-old kid to the 10p.m movie? Such a bad parenting I suppose. 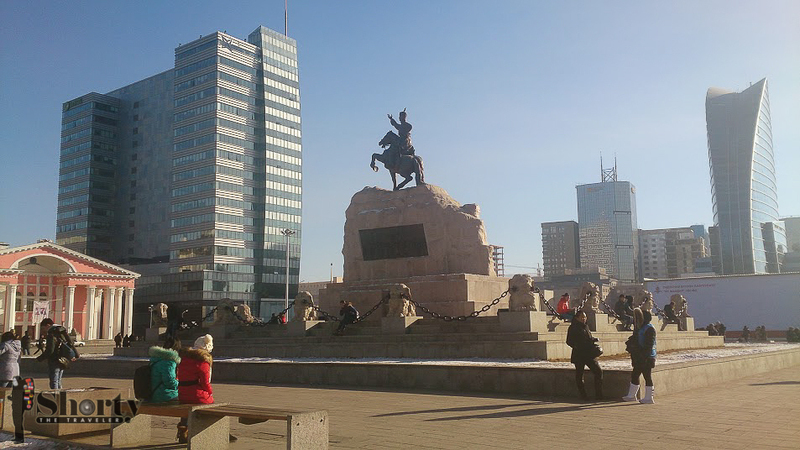 The most important lesson that I learnt from Mongolia: How to survive the harsh weather! The inexpensive insoles, fleece pants and camel socks. If you want to survive the Siberian weather, these people know what it needs to march on. -5 Celsius? Easy peasy! I thought that I was all prepared and braced through Ulaanbaatar on the first day with just 2 layers of jackets and thermal shirt, of course. And boy, I had to literally jog on Peace Avenue and managed to crack one or two pavement. If I were a frog, I might have died of hypothermia or at least lost a hand due to frostbite. It’s no joke when it comes to keeping warm in Siberia. Either spend some money to enhance your ability to move or just stay warm in your bed. I now present to you the last collection of photos from Mongolia. Hope it is enough to tickle your travelling senses and lure you to the land of Shamanism and great winter experience. Enjois!